My name is Law Wha. I am 25 years old. I was born in Law Da Lay village, Loi Kaw Township of Karenni State. I am Kayah of Karenni nationality. I am one of the SDC students from the SDC and have been learning there. My parents are farmers. My family moved to Baw La Khen Township from Law Da Lay village in 1992 to find freedom from the political situation under the ruling of the SPDC government and the Burmese military government. When we arrived in Baw La Khen, my father bought a plot of land and built a small house with the little money he had. After arriving there, the economic situation of my family worsened, and as a result, we had nothing to eat but boiled rice. There are 9 members in my family including my parents. I am the 3rd of 7 children. I start school when I was 5 years old, but because of my parents’ bad economic situation, I had to leave school for 1 year and stayed with my parents in the jungle to help my parents cut down trees to burn in order to make as charcoal and earn a living. My parents cut trees to burn for charcoal day and night for 5 years. Because of my young age, the hard work affected me physically, and my health deteriorated and I was no longer able to help my parents. When I was 7 years, I returned to primary school and started grade 2. I was 10 years old by the time I finished 4th grade. After I passed 4th grade, my family moved to another village, called Zwya Thit village, in Baw La Khen Township. I started 5th grade in the village of Zwya Thit and after finishing 6th grade, I left school because one of my elder brothers passed away and another one went away and left my family. So, I was very sad and did not want to be a burden on my parents who had many children to look after. Due to this situation, Ii left school and worked to help with my parents for 8 years to support my family. After that, I fled my home and came to Karenni refugee camp with the hope of finding a job in Thailand to make money and provide for my family. With the help of the KNPP (Karenni National Progressive Party) army, I passed through the jungle. It took 5 days and there were many challenges, including the dangers to avoiding the SPDC arm forces. On the road through the jungle, we had a lot of rain day and night, so we could not sleep well most of the time, and we did not have enough food. 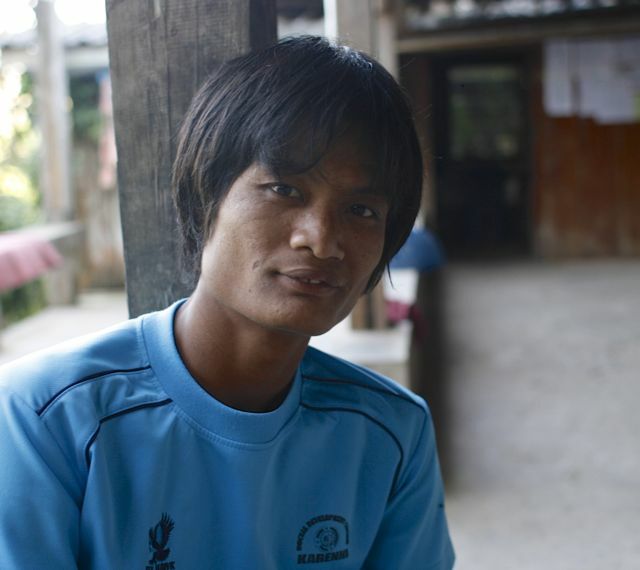 I arrived in Karenni refugee camp #1 in 2008, and at first, I intended to find a job in Thailand, but because of my status as an illegal migrant, it was very dangerous for me to work in Thailand, so I worked there for only one month and then returned to the Karenni refugee camp again. I used to stay with my aunty when I returned from work and I tried hard to study my lessons to finish grade 10. I made up my mind to go to school for further studies to improve my future life. So, in 2009 i started 8th grade and finished 10th grade in 2011. After finishing 10th grade, I acted as a school liaison officer for the High School in Karenni refugee camp #1 for 1 year. To obtain further study I chose to apply to Karenni Social Development Center (SDC) in 2012 because I am very interested in the subjects of Human rights, Environment and Rule of Law, which are taught at SDC, and because these subjects are closely related to my life and to my community. Before attending this training course, I had never heard or learned about Human Rights, the Environment and Rule of Law, because these subjects are forbidden in Burma, and therefore there is no opportunity to study these subjects inside Karenni State. So, before attending this school, I had no knowledge of Human Rights, Environment and Rule of Law. After attending this training course at SDC, I see myself as a person with much more foresight, because since I have started studying this knowledge, I have been able to apply better judgment when deciding right or wrong. The knowledge I have acquired so far has changed my attitude and provided me with many good ideas. Further, my teachers have greatly influenced my social relationship and how I relate to my community. Before attending in this training course, I had never thought about political issues and what and how I could make positive change in my community, rather I was only thinking about eating, drinking and being happy throughout my life. But since I started attending this training, my mind has changed greatly in a positive way. I have started to think about Karenni state and how to regain our basic rights, which we have lost. I have also started to think about why so many of our people have become refugees, the causes of the problem, and the people and groups contributing to the problem. Further, I have started to think about the environmental problems in the forests in Karenni State, as our resources are being exploited and the water and air are becoming increasingly polluted by products such as plastic, can and rubber, etc. By attending this training course, I have come to recognize the people and group who are creating these problems in our community, how to protect and preserve our environment for sustainable development. Before attending in this training course, I knew nothing about the law and as a result of this lacking in knowledge; I usually looked down on others and often started fights with them. I often had no idea how to solve problems which occasionally occurred in our community. But now by attending in this training, I am able to recognize different points of view and my social relationships have become much better than before. Before attending in this training, I knew nothing about constitutional law, the system of government and the judiciary system. But now, I understand and am able to review the constitution written and laid down by the military government in Burma in 2008, and judge whether or not the constitution is democratic. By understanding this knowledge, I am better equipped to protect innocent persons and recognized the wrongdoing of perpetuators of human rights abuses. By attending this training course, I have become more, and I am very happy and pleased to understand the concept of the rule of law and how it is important to our community and essential for all human societies. In my opinion the subjects of Human Rights, the Environment and Rule of Law are very important and are essential for building peace, justice, happiness, freedom and sustainable development not only for our community but also all over the world. These are important concepts and are vital in human society. After finishing this training course, I intend to apply for the 4th Advanced Community Management Training Course organized by SDC. But if I am not selected as a candidate, I will try to go inside Karenni State to spread and share the knowledge that I have learned from SDC to people who lack such knowledge because it is not enough for only me and my fellow students to understand this knowledge but not the majority of people. This knowledge teaches us how to respect each other and respect the rights of others, and how to preserve our environment together. I hope that one day I will be able to contribute to my community in a positive way. So, I have been devoting a lot of thought to how I can create the ways or means to implement my aims and this aim in my future life. I hope that this training course will continue in the long term for generations to come, because the knowledge taught in this course is very important to our community and for all human beings. If possible, I would like to suggest adding additional subjects which are important to our community.